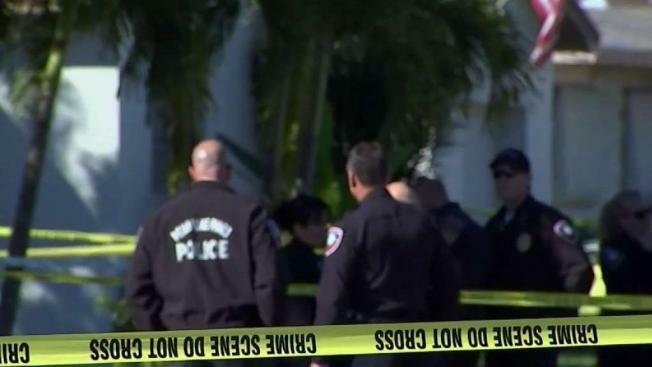 Police say a husband killed his wife before killing himself as officers responded to his Pembroke Pines home. NBC 6's Jamie Guirola reports. A man fatally shot himself in front of police officers at his Pembroke Pines home Tuesday after authorities say he and his four children spent days living with his slain wife's body in the home. Officers conducted a welfare check at around 9 a.m. at a home in the area of NW 76th Avenue and NW 6th Street after an anonymous caller told authorities four children living in that residence had not been to school for a week, according to Pembroke Pines police. Police made contact with the husband, who appeared to be impaired. When asked if he was drunk or on drugs, he said yes and also told police he was going through hard times because his wife left him, authorities said. Officers started searching the man, who was repeatedly placing his hands inside of his pockets, police said. He then pulled out a firearm and shot himself in the head. He was declared dead at the scene. Four children under the age of 10 were found at the home and taken to the custody of their grandparents. They appeared to be uninjured. Their mother's body was found in a rear bedroom, and she appeared to have been dead for several days. The cause of her death is unknown. Police have not released the couple's identities. Pembroke Pines police said the investigation is ongoing. Further information was not available. Anyone with information regarding this incident is urged to contact the Pembroke Pines Police Department at 954-431-2200, email to tips@ppines.com, or call Broward Crime Stoppers at 954-493-TIPS.